Adela Trujillo, the Director of Family Wellness at the Community Action Agency of Southern New Mexico (CAASNM), has been selected as one of ten honorees for the Lewis Hine Award. The award is named for Lewis Wickes Hine, an early 20th century muckraker whose photos of child labor practices were instrumental to the passage of the Fair Labor Standards Act of 1938, a federal law that protected children from workplace exploitation. Since 1987, the National Child Labor Committee (NCLC) has annually recognized ten people across the nation – five volunteers and five professionals – for their exemplary records of service to children and young adults. Adela’s selection as an honoree is the product of decades of her hard work and dedication to the children of New Mexico. 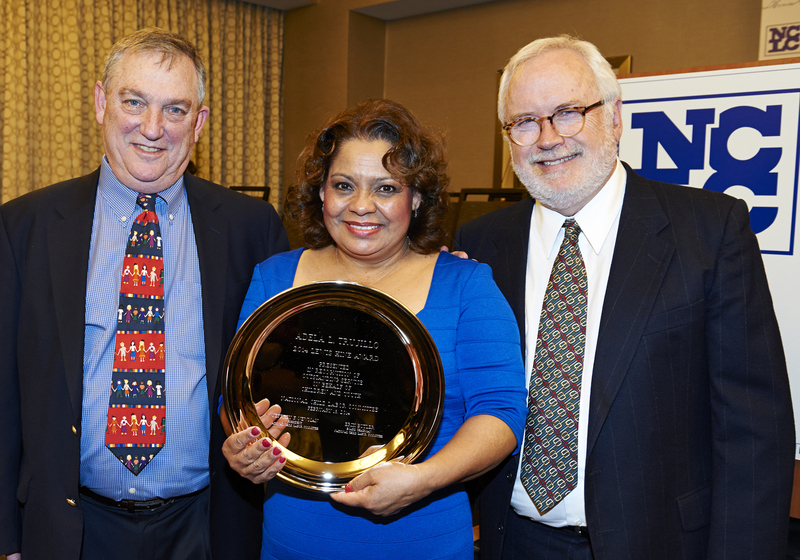 Adela began working with children in 1984, as a home monitor for the Child and Adult Food Care Program (CACFP). CACFP is a federal program that reimburses home daycare providers for ensuring that they serve healthy meals to the children under their care. In 1996 Adela started working at CAASNM as the organization’s CACFP director. Her new responsibilities included recruiting, training and managing new CACFP monitors. “You always have to be available,” she said. “Finding them (new monitors) when they’re lost, picking them up when their cars break down and coordinating tows”. In addition to going the extra mile (or several) for her monitors, Adela continued to do so for her clients. During her time as CACFP director, the program experimented with reimbursing care providers via debit card instead of mailing checks to them. The theory was that using debit cards would give CACFP participants faster, easier access to their money. The reality was a bit more complicated. “I got a call that one of the ladies (a CACFP care provider) was knocking on the ATM, trying to use her debit card,” Adela recounted. “She didn’t know how to use a debit card and because she only spoke Spanish she was embarrassed about going into the bank and asking for help. So we went with the providers to teach them about using debit cards”. Adela looks forward to helping even more providers and children in her new role as director of the Family Wellness group. In addition to overseeing CACFP, she will also be managing new initiatives like the child nutrition program. “We will be taking nutrition directly to the kids, teaching them how foods work in their bodies,” Adela said. The ‘we’ is literal – Adela has always made time to check in with providers and plans on doing so in the future. “These providers get used to us, we establish a relationship with them,” Adela said. “And I like to stay sharp and keep those same skills”.